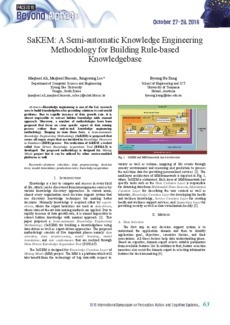 Knowledge engineering is one of the key research area to build knowledgebase for providing solutions to real-world problems. Due to rapidly increase of data growth rate, it is almost impossible to extract hidden knowledge with manual approach. Moreover, a number of methodologies have been proposed that focus on some specific aspect of the data mining process rather than end-to-end knowledge engineering methodology. Keeping in view these facts, a Semi-automatic Knowledge Engineering Methodology (SaKEM) is proposed that covers all major stages that are involved in Knowledge Discovery in Databases (KDD) process. For realization of SaKEM, a toolset called Data Driven Knowledge Acquisition Tool (DDKAT) is developed. The proposed methodology is designed for Mining Minds project but it can be utilized by other service-enabled platforms as well.